Ford has auctioned the rights to 1st production builds several times in recent years and it’s that time again – this time the rights to the 2020 Mustang Shelby GT500 VIN #1 for a cool $1.1M USD. And for an excellent cause: the Juvenile Diabetes Research Foundation, to which Ford has now contributed a total of $70M. This will be VIN #1, the 1st production build, with whatever options and colors the winner specifies. A start date for GT500 production hasn’t been announced yet, but is likely to be sometime in the summer. So in the meantime we get a close look at an Orange GT500. And it’s always good to see Edsel B. Ford II in action too. 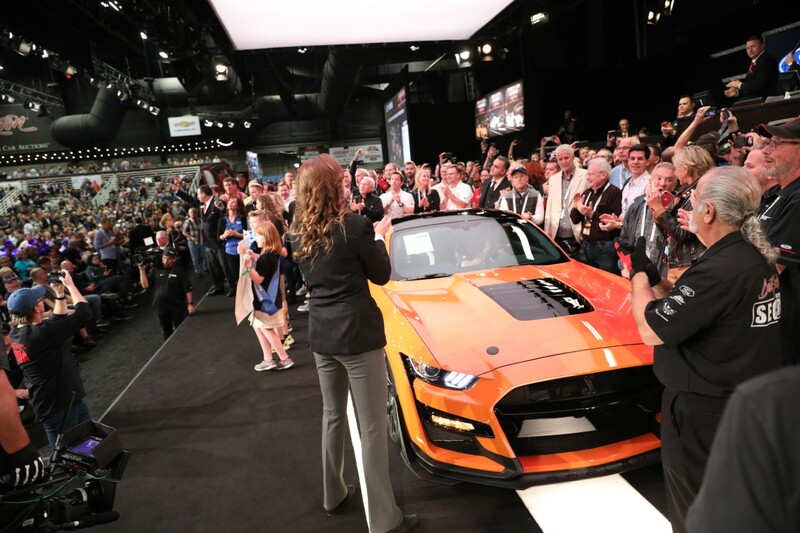 Jan 18, 2019 | SCOTTSDALE, Ariz.
SCOTTSDALE, Ariz., Jan. 18, 2019 – The very first model of the most powerful factory Mustang ever was auctioned tonight for $1.1 million as it goes for the famed muscle car’s biggest win ever – trying to help researchers cure children with type 1 diabetes. Craig Jackson, chairman and CEO of Barrett-Jackson, was the winning bidder. This highly anticipated, 700-plus-horsepower 2020 Shelby GT500 – VIN 001 – was auctioned at the Barrett-Jackson Collector Car Auction in Scottsdale with all proceeds going to help JDRF, the leading global organization funding type 1 diabetes research, find a cure. 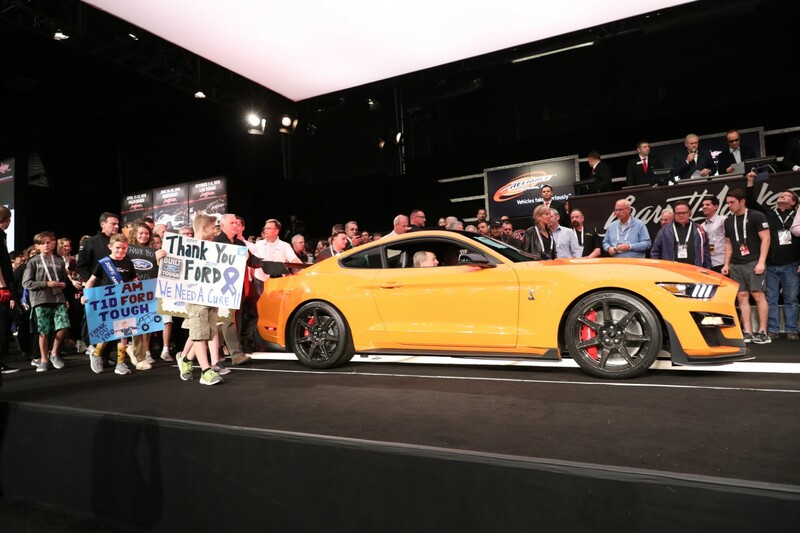 Edsel B. Ford II and Aaron Shelby, grandson of the legendary Carroll Shelby, rekindled the performance magic of their two families and energized the auction arena by accompanying the all-new Shelby GT500 onto the block. The winning bidder of Lot No. 3008 – selling at “no reserve,” or simply the top price is tendered at the auction – became the owner of the coveted first production Ford Shelby GT500 and can choose from available colors and options for the model. Proceeds from the auctioned car are being donated to JDRF. The 2020 Mustang Shelby GT500 draws on Carroll Shelby and Ford’s many performance collaborations that began with the Cobra roadster in 1962, which went on to win a world championship. Working together, they also broke the European stranglehold on Le Mans, winning the most important sports car race in the world with the Ford GT-40. When Ford Motor Company asked Shelby to turn their new Mustang into a race winner for the 1965 model year, the small block Ford Shelby GT350 was born. In 1967, the big block-powered Ford Shelby GT500 was unveiled and it became a star among fans worldwide. In 2006, Ford and Shelby announced a new generation Ford Shelby GT500. The first 2007 model year car available to the public was sold at Barrett-Jackson in Scottsdale with Edsel B. Ford II and Carroll Shelby watching from the block. The limited-production car will be available in the United States and Canada this fall. For auction information, visit the Barrett-Jackson website.